Thanks to: nicomen at #amigadev for gfx and coding support. The object of the game is to eliminate all of the blocks. 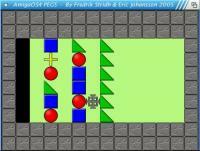 1, The player can move all circles, quads, crossed and triangles. 2, The iceblock can not be moved. 4, If you move into a black hole then you lose. 5, If two different blocks are put together then you lose. 1, When two circles collide they both disappear. 2, When circles are put into a black hole they(the circle) disappear. 1, When two quads collide they both disappear. 2, When quads are put into a black hole the black hole disappears. select a new block with the up/down key and enter to confirm. 2, When crosses are put into a black hole they (the cross) disappear. 1; When two triangles collide they both disappear and you get an iceblock. 2, When triangles are put into a black hole they (the triangle) disappear.